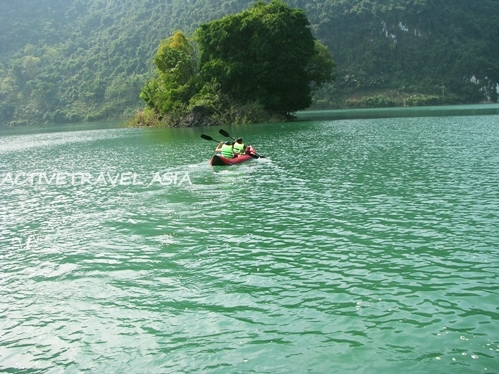 At nearly 150 meters above sea level, Ba Be is Vietnam’s highest and biggest lake. It remains full all year round. 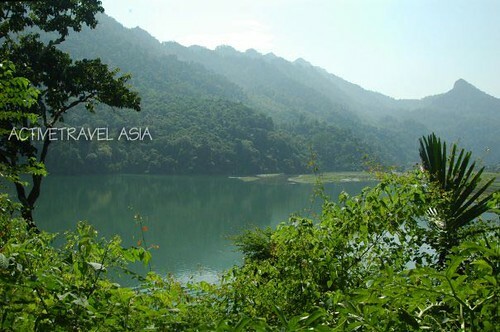 Ba Be mean three lakes in Tay language, Ba Be Lake is nine kilometers long and averages one kilometer across. The lake’s deepest point measures 35 meters. The road to Ba Be Lake is winding and crooked. At times concrete gives way to dirt and I begin to wonder why I’m travelling 240 kilometers northwest of the capital’s comforts. By car, this trip can take seven hours. Perhaps it is this treacherous road that keeps the mountains surrounding Ba Be Lake primitive and unspoiled. As we neared the lake, the sky opened up and a powerful mountain rain began to fall. I was overwhelmed with the strength of this rain, which seemed to blur the soft green lines of the forest. As the rain reached a frightening ferocity, Ba Be Lake appeared below us. The lake emerged through the tree branches like a powerful aquamarine monster. Stalks of vermillion corn and rice lined its banks while a patch of floating grass hung on the watery surface. The lake continued to peer at us through the trees as we inched seven kilometers down into the valley toward our home stay at the water’s edge. Ms. Ho, our Tay host was waiting patiently in her raincoat. Behind her, a large wooden house loomed on stilts. Like other traditional Tay homes the main house is situated next to the kitchen. Family life takes place on the second floor while the ground “floor” acts as a kind of barn for water buffaloes and chickens. Our terrace overlooks a small green field and a winding river that empties out onto Ba Be Lake. From here, the neighboring houses peek through the sprawling green like tiny mushrooms in a damp field. Before long, night falls and tranquility settles over the valley. Sleep comes to me so softly. The next morning we awake to the quacking of ducks. Our breakfast consists of fresh vegetables from the garden and fish caught in the small river in front of the house. “It rained heavy yesterday so the fish came up from the river bed. We caught a lot of fish with our vó (lift net, a traditional fish trap),” Ho said. The pleasant mother said her family began opening their home to guests years ago, but they still maintain land for cultivation. Their days are spent in rice paddies, corn fields and their home vegetable garden. They keep chickens and ducks. Sometimes her husband takes tourists out for a row on the lake. Life here seems simple and good. In the morning, before making our way out onto Ba Be Lake we attempt to catch fish using the vó. We set the four bamboo sticks lined with the netting into the water and wait. When we feel a little movement, we yank the contraption out of the water. All around us, we see fishermen engaged in the same hunt. In the end we catch a few small fries and spend a while under the trees snacking on our catch. “We should come back here tomorrow with some books,” my friend said as we wandered through rows of trees that seemed ready to fall into the river. At 2 p.m., our boat was ready. Because we wanted to see a lot, we opted for a motorboat over the traditional long boats rowed by locals. The midday sun had transformed last night’s big green “monster” into a giant, sparkling diamond. “We are on a lake 150 meters above the sea level,” I nearly shout, just to hear my voice echo through the valley. The lake is so big that sometimes we have the feeling we are at sea. The shape shifts as it curves though channels lined with ancient evergreen forests. We float along on a deep blue; above us, white clouds cling to the mountain tops like the last remaining bites of cotton candy on the cone. I try to picture myself in this place. Farming. Fishing. Picking fruit in the forest. The boat passes by a stand of Voi trees (a kind of plant whose buds and leaves can be used to prepare a drink like tea). My friend dives into the cool water and begins a slow swim. I step onto the bank and begin picking Voi buds to make tea back in Hanoi. As I begin plucking the buds, our guide tells us about a python that swallowed a whole goat on a nearby hill. I step nervously back into the boat, leaving the Voi trees alone. The boat man tells us that we are approaching the Dau Dang water fall. Here, a stream bloated by last night’s rain feeds red clay rain into the deep blue. We spent the rest of the afternoon exploring the quiet streams leading off the lake, following the gentle sounds of the falls, fishing and wandering through the woods.